Figure 9.13 Tile No. 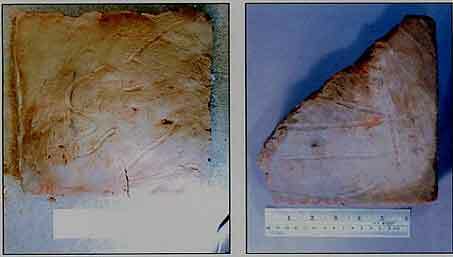 FG-81-4432 from Field I, Unit 2, Locus 3 showing example of two tiles mortared together. 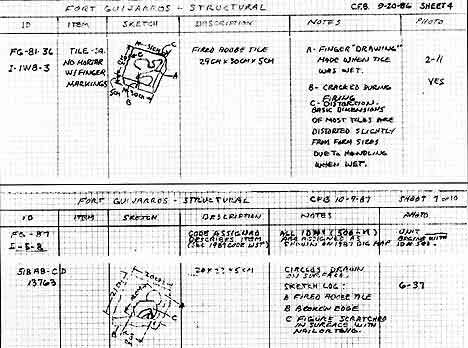 Fort Guijarros Structural Report, CFB 8-30-86, Sheet 3.
as tiles with mortar on both sides, or as tiles with mortar on one side which showed impressions of mating tiles as in Figure 9.14 (item FG-I-1-WB-2, Tile 18; CFB 8-16-86 Sheet 1). While this is not conclusive evidence of 2-course tile coverage over the entire fort parapet wall, it suggests this method of tile covering of the structure was used. For the purpose of this publication, tiles are made of molded adobe clay kiln-fired to a brick-red outer surface with various areas of the core appearing black from incomplete firing. Tile thickness of the tiles is generally 5 cm ±1 cm. Figure 9.14 Tile No. FG-81-180 from Field I, Unit 1, WB (west balk), Locus 2 showing example of three-layer plaster, troweled over top and one edge. Spanish records indicate that 40,000 tiles were ordered for the construction of Fort Guijarros. It is here estimated that double-tiling the fort consisting of 12 merlons and associated embrasures would require 20,000 tiles. Single-tiling the esplanade would require 5000 tiles, while single-tiling the 4000 square feet of building walls and floors would require 7000 tiles. The total number of tiles used would be 32,000 12-by-12 inch tiles, or using a mix of 12-by12, 8-by-12, and 8-by-16 inch tiles, it is reasonable that Fort Guijarros would have contained 40,000 tiles. An example of this 2-course tile laying phenomenon is a composite tile, mortar, and stucco specimen, catalogue item 4432 shown in Figure 9.13. This item was uncovered during the 1981 excavation, area I-2-3, about 6.56 feet seaward of the fort's cobblestone core wall. In this examination, it was imagined what tile-laying pattern would have been used to construct a portion of the fort parapet at one of the embrasures (cannon ports). 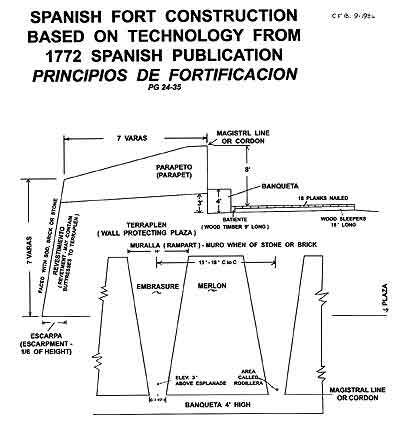 Dimensions of construction were taken from the 1772 Spanish publication Principios de Fortificación, from which Figures 9.8, 9.10, and 9.15 were drawn. Dimensions of tiles used are from those found in the 1981-1987 excavations. 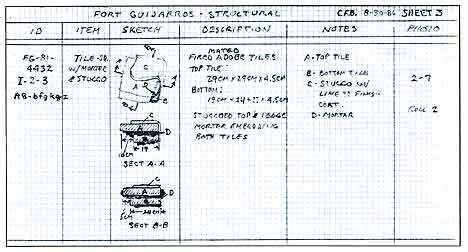 Figure 9.16 shows how this composite tile specimen fits and confirms construction similar to that shown in the sketch. Further examination of construction materials may reveal other such analogies. Figure 9.15 Spanish Fort Construction. 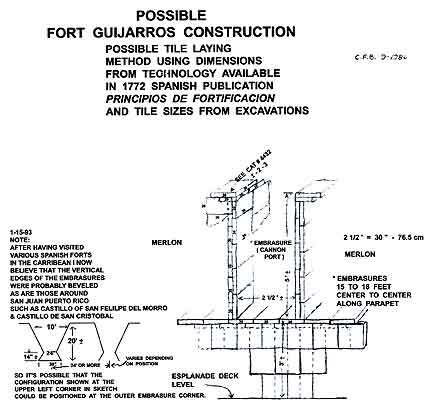 Figure 9.16 Possible Fort Guijarros Construction. 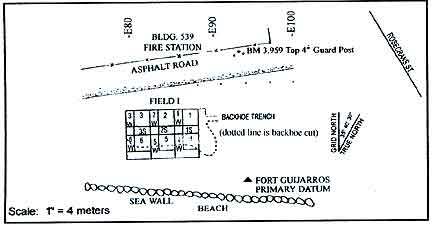 From field excavations and research, it is surmised that the overall plan or shape of the fort was that of a wide open “U.” A central fort wall faced east carrying cannons directed to the length of Ballast Point. A wing wall in a northeasterly direction would have provided cannons directed over what was then the San Diego port area. A second wing wall in a southeasterly direction would have provided for cannon fire toward the entrance channel to San Diego Bay and port. The logical configuration of these walls to provide effective lines of fire from the given terrain would be for the wing walls to project out from the central wall at a 30-degree angle. Several composite tile and mortar items (catalogue items 23, 13857, and 13875) excavated near the southeast end of the central wall indicate and support the hypothesis that the tile covering of the merlons had to accommodate a turn in the wall construction of approximately 30 degrees (Figures 9.17, 9.18, and 9.19). Figure 9.17 Tile No. 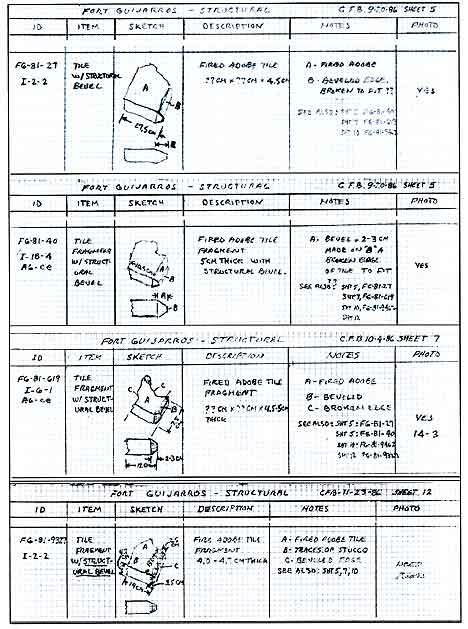 FG-81-23 from Field I, Unit 2, Locus 2 showing composite of tile and mortar. Figure 9.18 Tile No. FG-81-13857 from Field I, Unit 1, Locus 4 showing composite of tile and mortar. Figure 9.19 Tile No. FG-81-13875 from Field I, Unit and Locus not identified, showing composite of tile and mortar. In some cases mortar impressions indicate tiles were interfaced with cobblestones, and in a few cases, impressions indicate that tiles were mortared to unfired adobe or compacted earth. Cobblestone impressions could be those of the core wall, while adobe and compacted earth could indicate the interior of the parapet structure of merlons between cannon ports. Many of the tiles analyzed were too damaged by tide water to establish to what they were originally affixed; only size could be determined, and in many cases only the thickness of the tile was measurable. Of the tiles analyzed from the 1981 and 1987 excavations, 65 were whole or sufficiently so as to be able to determine all dimensions. Of the 65 tiles 75% were 30-by-30-by-5 ±1 cm; 5% were 20–by-30-by-5 ±1 cm; 112 were 20-by-40-by-5 ±1 cm, and 8% were trapezoidal of varying sizes as in 1987 dig items 43 (Tile 13746), 130, and 552 shown in Figure 9.20. Figure 9.20 Trapezoidal Tiles 43, 130, and 552. These do not include the 11 triangular tiles of varying sizes with one beveled side (Figures 9.21, 9.22, and 9.23). Figure 9.21 Tiles of varying sizes. Figure 9.22 Tiles of varying sizes. Figure 9.23 Tiles of varying sizes. It is not known for what purpose these triangular beveled tiles were made. They are quite similar to one another and are apparently broken from a whole tile and beveled for a particular purpose. Several tiles were found that indicated they had been broken to fit a certain construction or repair situation as mortar was found on the broken edges. The irregularities of cobblestone construction would make this a requirement when sheathing the structure with tile. Eleven tiles thicker than the usual 5 cm were found (6 to 7 cm in thickness). In 1981 they were catalog items 9573 A and B; in 1987 items 15, 51, 69, 101, 158, 161, 222, 584, and 3A. Figure 9.24 is a typical example. While none of these tiles were whole tiles, several were sufficiently intact to reveal a width of 20 cm. It is suspected these 6-to-7-cm-thick tiles were of the 20-by-30 or 20-by-40 cm size and might have been for a specific use such as hearth or fireplace tiles. While the majority of the tiles excavated were 5 cm thick, a number of tiles excavated from a Spanish trash pit (Field IV) were 3.8 cm thick. Figure 9.24 Typical example of thicker tile. A number of tiles contained scratches, doodling, or imprints on their surfaces (Figures 9.25 and 9.26). The significance of these added features must be left to additional analysis and imagination. 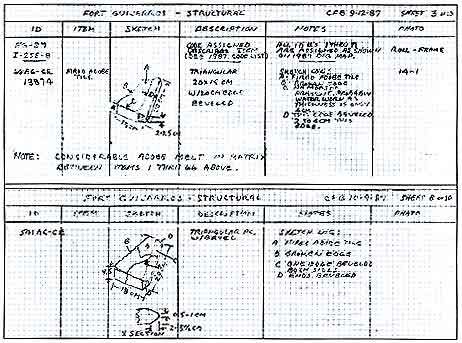 Figure 9.25 Sketches of tiles with doodling. Figure 9.26 Two examples of tiles with doodling. Fort Guijarros Museum Foundation Photo Collection, P:94-1166 and P:95-1698. A number of wood fragments were found and analyzed. Of 583 fragments, 564 were redwood. While they are too small to relate to any original purpose (between 0.1 and 9 cm), it is believed that the redwood is probably from such original construction as the reported timber beams and planking that made up the esplanade deck upon which the 9-pound cannons rolled. The 19 items which are not made of redwood are likely from a later era. An idea of how this deck may have been constructed may be seen in Jay Wegter’s watercolors. It is suspected that additional research of records and drawings will reveal more of this structural feature. 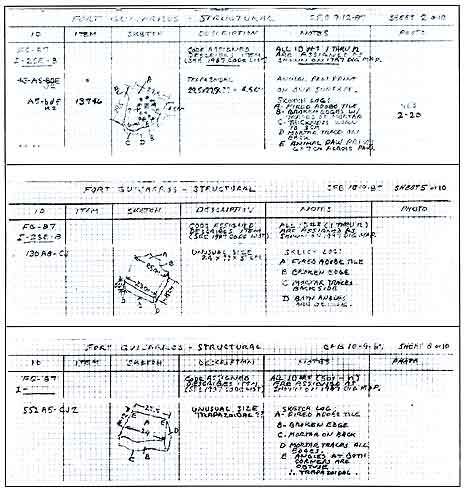 All construction materials analyzed to date are recorded and tabulated; copies are made and included in the field notes. 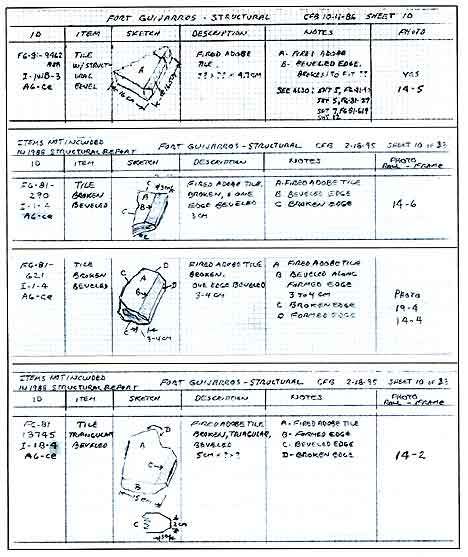 This tabulation includes noting the catalogue number, sketches, description and photograph numbers (if applicable) for each item. Photographs are not included here but are on file in the Fort Guijarros Museum Foundation's archives. Unfired adobe was found throughout the excavated rubble. The size of the adobe blocks from which these fragments originated has not yet been determined. However, even after years of erosion, there is enough adobe present to suggest that it was used (in either block form or as a compacted mass) as either a forming wall or a core fill for the merlons and other portions of the parapet structure. 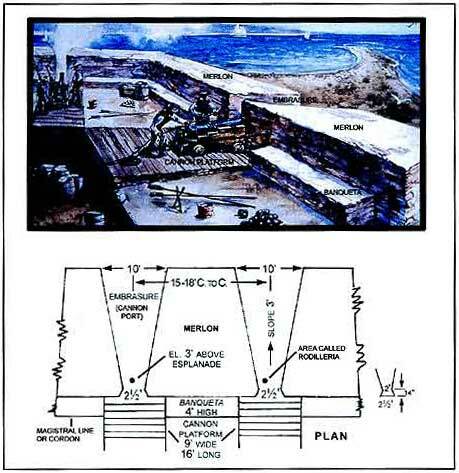 Technology of the day dictated a parapet structure capable of deflecting incoming cannon and rifle shots as well as to buffer or absorb the impact of cannon balls without appreciable damage to the protective features of the fort. 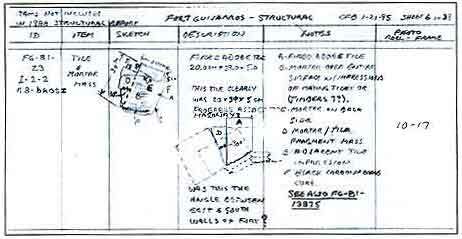 It is anticipated that as more material is analyzed and additional information is gathered and researched, a more detailed picture of Fort Guijarros will appear.